Hornet aim to cut costs and maintain quality when we source goods from China for our customers. That means we need responsive, high quality Chinese manufacturers. We have strict factory selection and audit processes to help us choose the right suppliers. Every so often, one of our Chinese manufacturers surprises us in a good way – here’s an example. One current project is for custom packaging, including a thick paper stock which needs to be printed and then folded into a classic bag shape. The project is at sample stage. 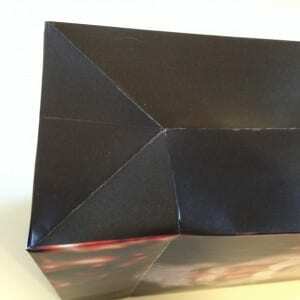 We specified a varnish coated paper. Here’s the sample we received. 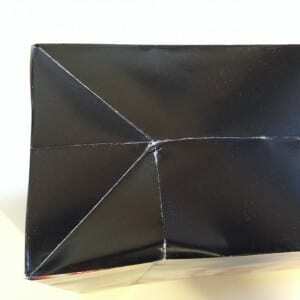 The black is consistent and glossy, but you can see that the folding has caused a problem. The varnish has cracked and the white of the paper underneath shows through. This isn’t going to create the high-value effect our client wants. It might sound simple, but we love the proactivity. This supplier did more than simply follow the specification. They looked at the end result. They decided it wasn’t good enough quality. They suggested an alternative. They sent a sample so that we could see what it looked like. If the supplier hadn’t done all that, we would have. But it would have taken an extra couple of weeks. Possibly more, at this time of year when Chinese New Year is approaching. So if you’re thinking of sourcing from China and everyone tells you Chinese quality is poor, think again. There are certainly many poor quality Chinese manufacturers, but there are also many high quality ones. Nor are they all working for multinationals like Apple, Nike or Ford. There are plenty of small to mid-size Chinese manufacturers with a commitment to quality and customer service, who are a perfect size to work with small to medium Australian businesses. It’s just a matter of finding the right ones. If you need some help doing that, just ask Hornet.